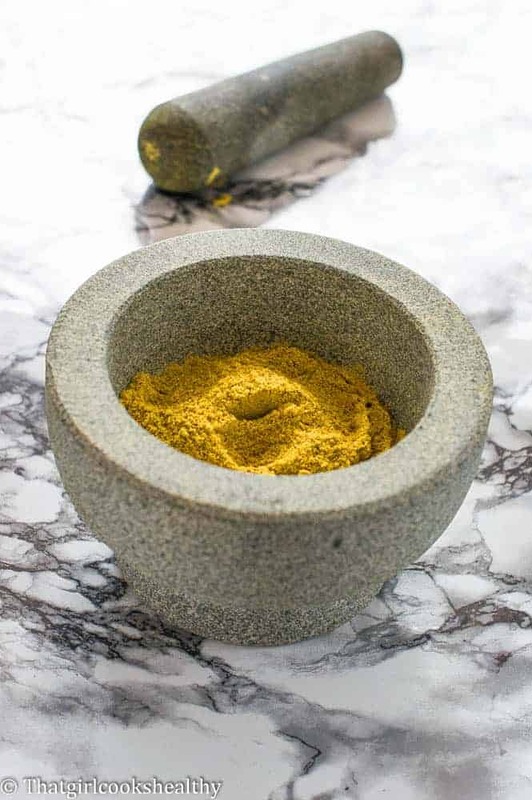 Poudre de colombo – Learn how to make this French Caribbean fragrant curry powder blend to add to your poultry, soups and stews. 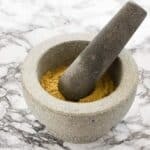 If you are fan of making your very own spice blends from scratch then you are in for a real treat because this curry powder is fragrant and very very complimentary to any dish which it is seasoned with. What is poudre de colombo? In short pourde de colombo also known as colombo powder is a curry blend which hails from the French Caribbean. It is used in Guadeloupe, Martinuque, St Marin, St Barts and other local regional French colonies. The origins of this seasoning is believed to come from immigrant plantation workers who came from Sri Lanka with the capital city being colombo. Colombo also lends it’s name to the dish known as colombo chicken a thick stew. You can also make a stew using any type of poultry including goat, lamb or pork. When I adore about poudre de colombo is it’s unique blend of flavours. Curry is widely used by most Caribbean Islands. However, in the French Caribbean their curry has a different take to that of Jamaica, Barbados, Trinidad and so fourth. Uncooked rice is toasted and included for a nutty taste and serves as a thickener. What spices are in poudre de colombo? Some people like to add a dried chilli for heat along with ginger and cinnamon for a warming note. The quantity and various add ins make the colour of the curry varied – anything from bright yellow to a brown hue. Colombo curry powder very very easy to make and is ready in less than 10 minutes. 1, All you need is some whole spices. Alternatively, you can use ground spices but whole spice is preferred because they are more potent and a coffee grinder. If you don’t have a coffee grinder you can make this recipe using a mortar and pestle. 2, The first thing you need to do is heat a pan, frying pan or skillet works just fine. This is helps the spices to toast much quicker. I used brown rice because it’s more nutritional dense. 3, Start by toasting the rice, you will know it’s done because you will be able to smell it and the colour will have changed. 4, Then you want to add the remaining spices excluding the ginger, cinnamon and turmeric because these are your ground spices and there is no need to expose them to any heat. Again, all of the spices should be fragrant and ready so allow them to cool, you can leave them off the stove in the pan to rest for 5 minutes. 6, Mill into a fine, powder like consistency. Put the curry in a airtight glass jar, label with date and what it is and store in a cupboard or pantry for several months. On medium-high heat add a medium sized skillet to the stove. Proceed to toast the brown rice until it is fragrant anD slightly golden in colour, rotate and move the pan back and forth so each rice grain is toasted evenly. Then add all of the other whole spice excluding the turmeric, cinnamon and ginger. Again, toast the spices until the a strong in smell. 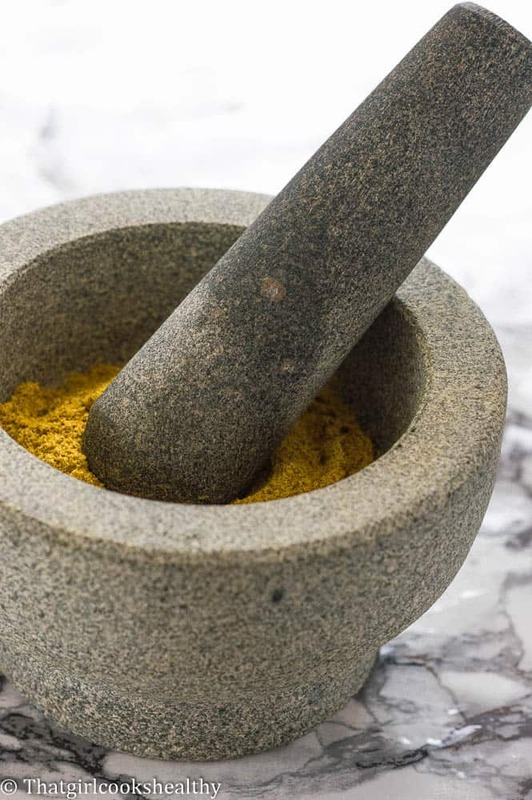 Add the whole spices along with the turmeric, cinnamon and ginger to a spice grinder and mill into a fine consistency. Store in an airtight jar, label and use within several months. Wow!!! Such a lovely bunch of spices, and I’ve never heard of rice being included. Fabulous. Thank you for sharing! The nuttiness of toasted rice sounds like it adds a wonderful flavor dimension to this powder. I can’t wait to try it! I just returned from France where I encountered Colombo curry for the first time. I couldn’t find any powder to buy because I was in a small town, but read online about the toasted rice & wanted a recipe which included it. Could I ask your source for this recipe? Is it a French Caribbean person, or a book? Hi Rea. I know someone who is from Guadeloupe who told me about it. I also do my research several times over to make sure I am very versed in a recipe that is outside of my own island before posting it.